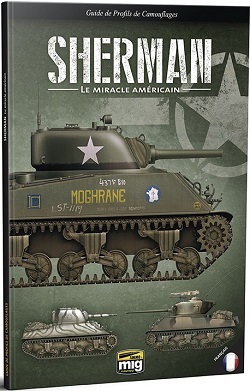 Sherman, the American Miracle. In this new AMMO publication, you will find all the information you need to paint and age all your model projects incorporating this famous American-built tank. More than 180 colorful profiles grouped by theaters of operation will inspire you in the creation of the most original projects, thanks to the attractive versions and camouflage patterns. This book shows that against all conventional wisdom, all Sherman tanks were not painted green. From colorful patterns that take us from the hot sand of the deserts of North Africa to the European battlefields, ending with the vehicles in service in the Pacific Theater of Operations, this publication will show you many original and rare examples of camouflage patterns from the Second World War. An introductory chapter will analyze the different versions of the Sherman to understand it in a simple and complete way. You will also find a section listing the different colors used to paint each example and used by different armies throughout the war. Whether you are passionate about this mythical tank or interested in Allied vehicles in general, you will not be able to miss this book.